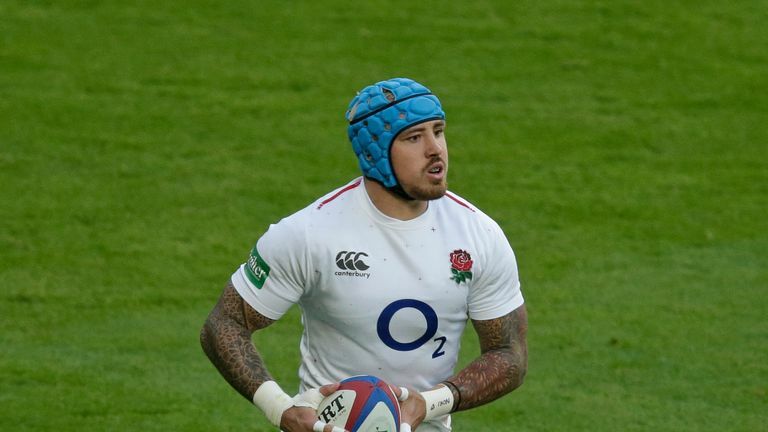 Jack Nowell says he has been given a "golden ticket" by England that gives him licence to roam in Saturday's Six Nations clash with Ireland. Nowell has been recalled to the left wing for England's opener in Dublin, a fortnight after Eddie Jones suggested he may select him at openside flanker. England's head coach has also considered picking a ninth forward and while he insists Nowell will operate as a wing against Ireland, the 25-year-old confirmed he will also be more involved up front. "Eddie's been very clear with me," Nowell told Sky Sports. "I've got the licence to play with the forwards, play a lot off nine and get myself stuck in. If anything it was a bit of a golden ticket for me to be able to go into a game knowing I've got the freedom to do this. "I really enjoy getting in the break-downs, I enjoy being around a lot of defenders so for me not a lot has changed." Nowell comes into the international set-up again after a two-month spell on the sidelines with a hamstring injury. Having only recently returned to fitness for his club Exeter Chiefs, he insists he couldn't wait to get back in time for the Six Nations. "If I get a bit of a niggle I want to try and get through it, it's the way I am as a person," he added. "I got injured in the autumn and straight away I was desperate to get back for this. "I was happy to get at least a couple of games for my club and now I'm back I'll try to make the most of it." England have failed to beat Ireland in Dublin since 2013 and although insisting the squad are well briefed on their opponents, Nowell says they want to assert their own authority in the match. "Eddie's always trying to challenge us and we're always trying to learn new things," he said. "Ireland are very well organised all over the field, it's not just their kicking. (Jonathan) Sexton knows how to control a game but we just have to concentrate on being ourselves. "We can stand in front of them in defence and we know our roles for that, but when we get the ball we want to make it about ourselves." Grand Slam champions Ireland are on a 12-match winning streak at the Aviva but Nowell hopes that run will end on Saturday. England have also been impressive of late, winning three of their four internationals this season, and the Exeter Chief believes the squad's versatility is a big reason for that. "We're always swapping in and everyone's learning every single role in different positions," he added. "It's important for the squad because you need to learn every position and you need to keep pushing each other until the very end and I think that's why we're so good at the moment. "It's about us enjoying ourselves, we've made that a focus this week. Hopefully we will see that at the weekend."